Bids are being fielded for a $168 million tollway project in southwest Hidalgo County, with a deadline of Nov. 10 at 3 p.m. 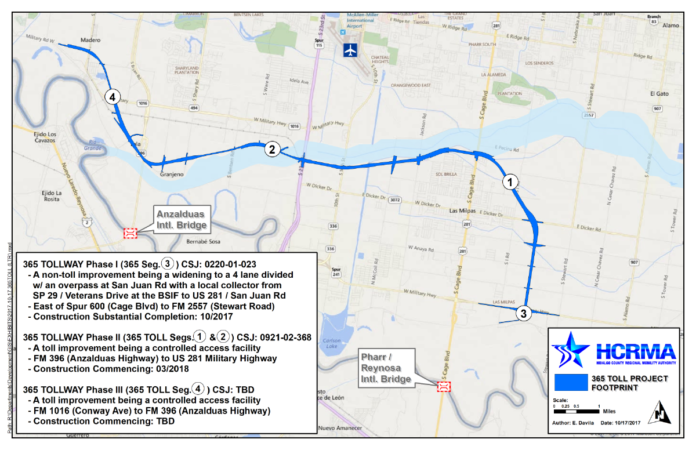 The 12.2-mile project, called the 365 Toll Project, will include a connection to and from the Pharr-Reynosa International Bridge. The road will run north past East Dicker Road before looping left across South Cage Boulevard, according to maps of the proposed project. The road will then run west through Granjeno and end south of Mission near the community of Madero. The contract will be awarded on Nov. 28, followed by a pre-construction meeting on Jan. 8 and a construction start date in March, according to Pilar Rodriguez, director of the Hidalgo County Regional Mobility Authority. The Texas Department of Transportation is contributing $128 million to the project. The state will contribute funding as well, according to TxDOT. An expected completion date is slated for September 2021. Toll roads have been a point of controversy in Texas. The state legislature killed a measure in May that would’ve allowed the Texas Department of Transportation to partner with private companies to fast-track some highway projects. Texas voters in recent years overwhelmingly approved new revenue streams for highway construction that was prohibited from going toward any toll roads. Yet supporters say toll roads are still needed because even the new voter-approved sources of revenue won’t provide enough money for the Texas Department of Transportation to keep up with the demand for more highway lanes. Opponents of expanding toll road projects throughout Texas say the public is getting increasingly displeased with paying both taxes and tolls.